Guatemalan President, Alvaro Colom, is in his last term. The Guatemalan constitution prohibits relatives of the outgoing president to run for re-election. Fortunately, President Colom’s political party is not using the strategy of Libyan President Gaddafi or Ivory Coast’s President Gbagbo by using force to stay in power. Instead the political party is exploiting a loophole in the law. 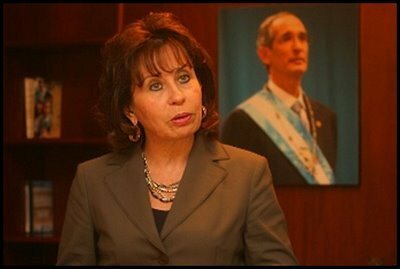 The political party intends to get around the constitutional prohibition by having President Colom’s current Wife, Sandra Torres run for President. In order for her to officially be allowed to run for President, Mr. Colom and Ms. Torres must be divorced. Once they are divorced, Ms. Torres will no longer be barred from running for President. Several opposition parties are challenging the divorce in court, but Guatemalan law allows divorce by mutual consent.